This morning I decided it would be a good day to sleep in and sleep in I did. Makenzie went to bed a bit late so she slept in with me! We got up and had brunch, took a bath, and put our jammies back on! This weekend Makenzie seemed to be a bit more sore. She wanted to be in her walker but she would lift her foot up and down to test the waters. Makenzie would then give a little push with each leg and then the process would start again. She was still moving forward but just a bit slower. I called Makenzie's PT on Sunday to ask her what to do. I was a bit concerned and worried. It seems like every time Makenzie surprises us with steps her legs hurt and we end up putting the walker back in the corner because she refuses to stand. She gave me few suggestions, assured me that Makenzie did not damage anything in her ankles or hips, and that she really was just sore. Makenzie was feeling much better this morning. She was taking bigger. She pushed through her feet harder and covered more ground much quicker. Such a relief! This afternoon Makenzie had occupational therapy. She did a great job! They started off playing with Makenzie's train. Instead of using the switch her therapist worked with her on using the remote control with her hands to make the train go. Makenzie did AMAZING!!! She has been using her hands so much more these days! She finally knows they are there and she loves it! Then it was on to the vibrating pen. Makenzie was not sure at first what to think about it. She made a few very funny faces but after a few minutes decided that it was a lot of fun! At one point she reached out with her hand and grabbed it all by herself. It was so much fun to watch her draw. She did a great job of looking down to see what she was doing. 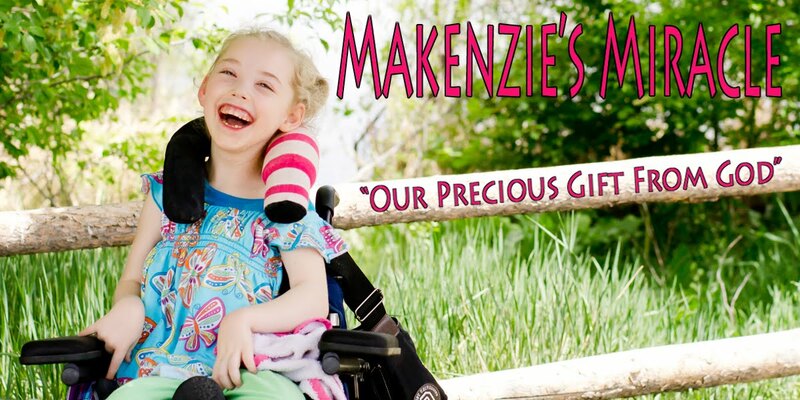 What a proud girl Makenzie was. To close out the day Makenzie got a full body massage from her PT. He muscles are definitely still sore but looking much better! Her therapist checked her hips and they looked and felt great! We can expect her to continue to be a bit sore for the next 2-3 weeks but it is such a good sore!!! School starts back again tomorrow after the long weekend. Bring on another great week!!! God is awesome, isn't he? Sometimes our journeys are hard but he opens our eyes to the blessings he provides. I'm so excited for you and MacKenzie!